Back in the fall Adrianne from On the Windy Side posted on her blog about wanting a pair of hand knit socks, and a skills swap partner who would be willing to trade for a pair. Being a newby knitter who practically exclusively knits socks, I threw up my hand right away for the opportunity for a fun swap from an über talented blogger that I love - and gosh was I ever floored with what she sent me! I'm sure you can imagine how quickly my jaw hit the floor when this is what I opened in December! 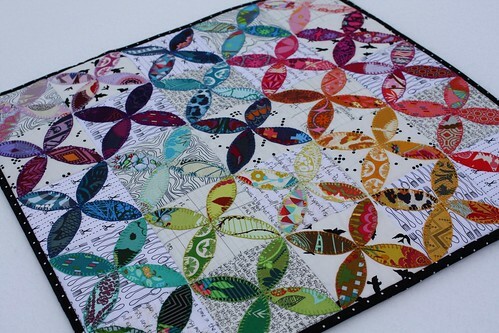 This mini quilt is hands down the most beautiful quilt I've ever seen... and it's all mine! 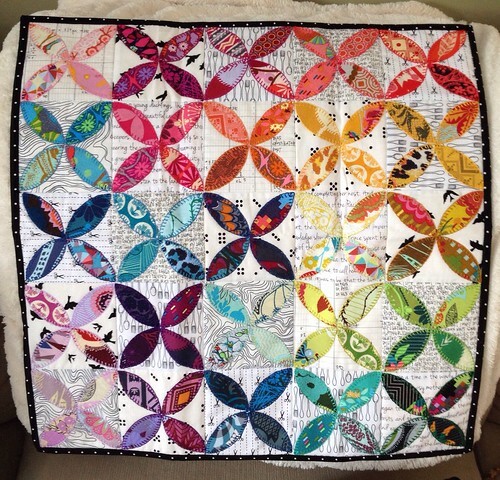 Adrianne used 100 different AMH prints from her stash to make this orange peel quilt and gosh am I ever grateful she shared her stash! I seriously wonder how she let this go! Adrianne recently made a video tutorial that demonstrates how she hand appliquéd each orange peel using blanket stitch (check out her video here). Her stitches are insanely perfect, that girl has mad stitchin' skills! 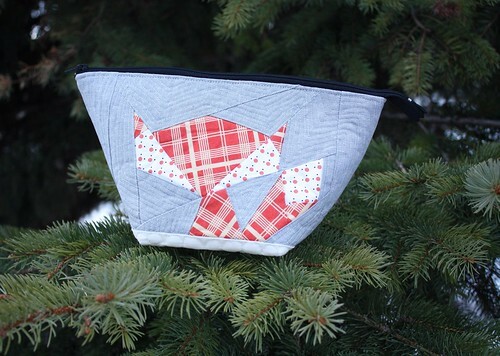 I love Adrianne's fox themed projects and was thrilled to open not one but TWO items with foxes on them *insert happy dance here* The wide open pouch above has become my newest and most favourite knitting project bag. 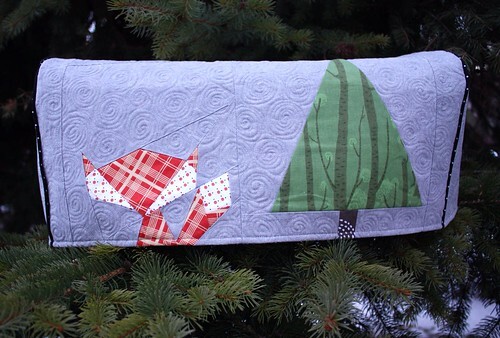 She pebble quilted the bottom and echo stitched around the fox. The details on this pouch are perfect. 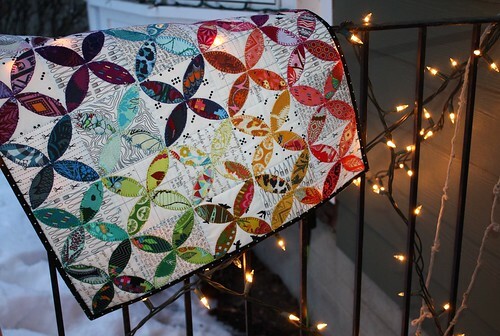 This sewing machine cover is gorgeous and has been keeping my machine cozy during my weekdays in the office. I love seeing it on my sewing table every day. 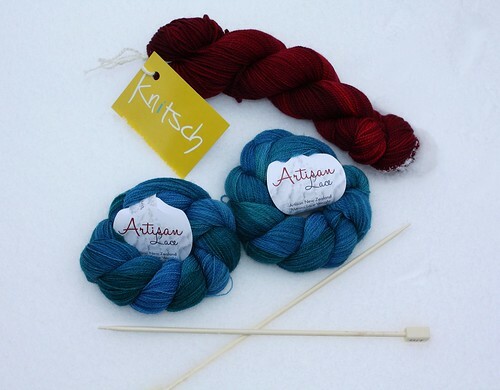 Based in New Zealand - the land of many sheep and much wool - Adrianne was extremely generous and tossed in two skeins of sock wool and a shawl kit! The yarn is soft and squishy and seriously drool worthy. You'll notice one skein of that red is missing... because I couldn't help myself and cast on a pair of socks already. 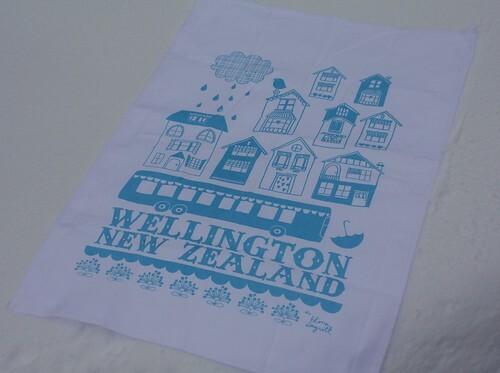 She also sent some NZ chocolate treats, a gorgeous local tea towel, some fun FQs, and a set of Christmas stockings with our initials on them! The stockings are made from my favourite Christmas line (Cherry Christmas) and my husband and I used them on Christmas morning. Seriously perfect! I took these photos outside while the light was fading and I though this twinkly lights shot might be a good way to end the post. For more info on the beautiful items that Adrianne sent in our swap, read her post about them here. Now go stand in line with a thousand other sewists that are dying to be her swap partner some day (we all know there is a line up now for sure!). Next week I'll be back to share the socks that I made Adrianne for our swap. Wow, that is an amazing swap package! 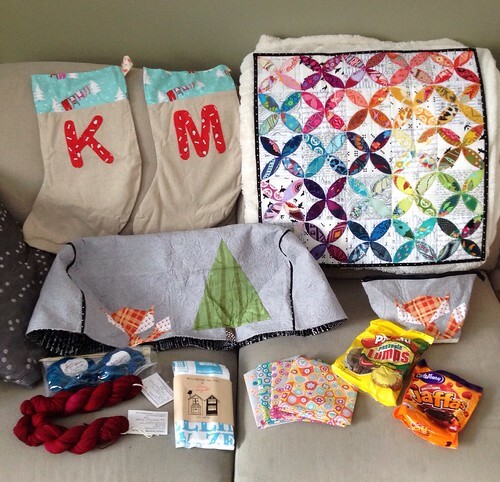 I adore Adrianne's AMH quilt and those are some serious extras! I can so see why your jaw hit the floor. That is just beautiful!! What an AMAZING swap you two had, on both counts! I've loved seeing the goodies. What a fun swap! Everything looks amazing! Enjoy your wonderful gifts! Great photos. That is by far one of the most awesome swaps i've seen! Lucky you! Whoa. That is mental!! You totally heir the jackpot! That mini is insanely gorgeous! From A & K - Winner, Winner, Chicken Dinner!